This great answer suggests the limiting high altitude to which the Curiosity rover on Mars could drive would be the top of Mt. Sharp (Aeolis Mons) - in the center of Gale crater. I'm wondering, is there enough imaging data from satellite images from Mars orbit to say something about the terrain and grades (slopes) that Curiosity would encounter if it tried to drive to the top? If there are boulder fields or sloping sand, the trip might actually be very unlikely for example. Also, are there any problems operating Curiosity at higher altitude? Is it colder up there, or are there other weather issues that might affect it? Can it run in a complete vacuum or are there some localized heating issues that do take advantage of the low pressure atmosphere so far below "sea level" on Mars? If the drive took 10 years, would the RTG still have enough oomph to keep it moving up safely and communicating? Do comms with Earth rely on any satellite who's lifetime is limited? Could it even make it to the top in 10 years, or would it take much longer? Anything else? below: "This image taken by NASA's Curiosity shows what lies ahead for the rover -- its main science target, Mount Sharp. The rover's shadow can be seen in the foreground, and the dark bands beyond are dunes. Rising up in the distance is the highest peak Mount Sharp at a height of about 3.4 miles, taller than Mt. Whitney in California. The Curiosity team hopes to drive the rover to the mountain to investigate its lower layers, which scientists think hold clues to past environmental change. 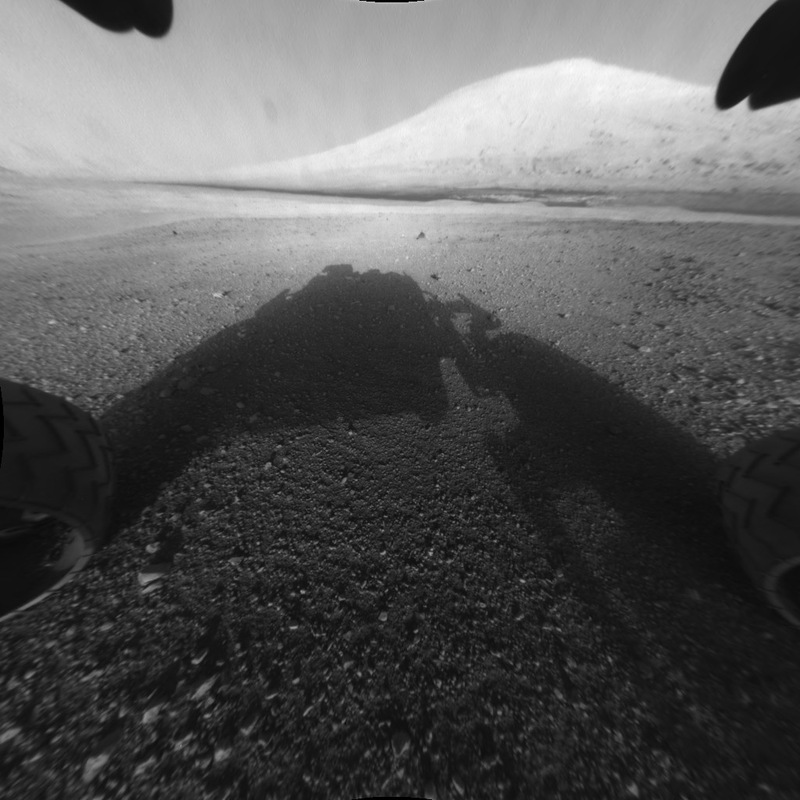 This image was captured by the rover's front left Hazard-Avoidance camera at full resolution shortly after it landed. It has been linearized to remove the distorted appearance that results from its fisheye lens." From here, original description at NASA. Summary: No, Curiosity cannot climb to the summit of Mt. Sharp, this map indicates the top of the mountain is not traversable. Curiosity was designed to be able to climb steep inclines. The rover is designed to withstand a tilt of 45 degrees in any direction without overturning. However, the rover is programmed through its "fault protection limits" in its hazard avoidance software to avoid exceeding tilts of 30 degrees during its traverses. The newest RTG, called a Multi-Mission Radioisotope Thermoelectric Generator (MMRTG), has been designed to operate on Mars and in the vacuum of space. The RTG was designed to power the rover for at least 14 years. The lower air pressure might affect lubrication or other items, but remember the rover had to fly to Mars, spending 6 months in the vacuum of space. The RTG was already running during that time. Trajectory planning starts with satellite imagery (from e.g. MRO), with a resolution of up to 90 cm/pixel. While this is pretty good, it can hide boulders that are large enough to block Curiosity's path, so the second step is using Curiosity's own cameras to survey the road ahead. "Wheel lifetime estimates show that with careful path planning the wheels will be operational for an additional ten kilometers or more, allowing the rover to reach key strata exposed on the slopes of Mount Sharp." This information further supports @Hobbes' answer. Curiosity landed on plains to the north of Mount Sharp in August 2012. 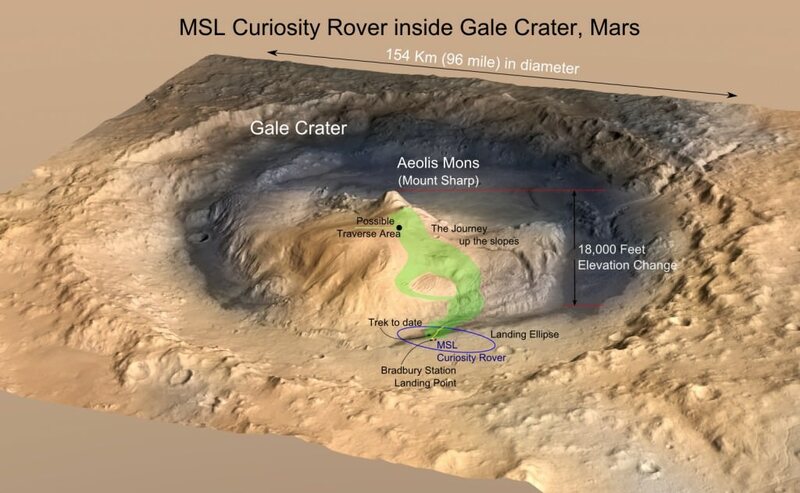 By June 2016 the rover had traversed 12.9 km to the southwest, encountering extensive strata that were deposited in a fluvial-deltaic-lacustrine system. Initial drives across sharp sandstone outcrops initiated an unacceptably high rate of punctures and cracks in the thin aluminum wheel skin structures. Initial damage was found to be related to the drive control mode of the six wheel drive actuators and the kinematics of the rocker-bogie suspension. Wheels leading a suspension pivot were forced onto sharp, immobile surfaces by the other wheels as they maintained their commanded angular velocities. Wheel damage mechanisms such as geometry-induced stress concentration cracking and low-cycle fatigue were then exacerbated. A geomorphic map was generated to assist in planning traverses that would minimize further wheel damage. A steady increase in punctures and cracks between landing and June 2016 was due in part because of drives across the sharp sandstone outcrops that could not be avoided. Wheel lifetime estimates show that with careful path planning the wheels will be operational for an additional ten kilometers or more, allowing the rover to reach key strata exposed on the slopes of Mount Sharp. Not the answer you're looking for? Browse other questions tagged mars rovers curiosity or ask your own question. Could the crashed Mars Express lander be imaged by the MRO orbiter? Would the MSL rover copy work on the Moon?